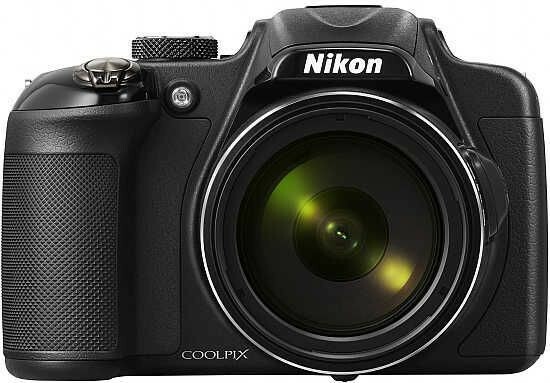 The Nikon Coolpix P600 is a new super-zoom compact camera with a mechanically-stabilized 60x optical zoom that offers a massive focal range of 24-1440mm. It also offers an innovative side zoom control, a 1/2.3" Back Side Illuminated CMOS sensor with 16.1 megapixels, sensitivity range of ISO 100 to 6400, and full HD 60i video recording with stereo sound and slow-motion video at up to 120fps. The Nikon P600 appeals further to the keen photographer with a full range of manual shooting modes, burst shooting at 7fps, 99-point autofocus system, focus peaking, built-in Wi-Fi connectivity, electronic viewfinder and a 3-inch 921K-dot vari-angle RGBW LCD screen. The Nikon Coolpix P600 is available in black or red for £429.99 / $4949.95 / €519.00. Measuring 125.2 x 84.1 x 101.6mm and weighing 565g, the Nikon Coolpix P600 is slightly larger than the previous P510 model, but its design is only minimally different. Like most high-end superzooms, the Nikon P600 sports a typical bridge camera look, with a chunky hand-grip, large lens barrel, pop-up flash and an eye-level electronic viewfinder. The deep grip is moulded to fit comfortably into your right hand, and is rubberised in a textured material for added comfort. The dominant part of the P600 is the new 60x zoom lens, which goes from an ultra-wide 24mm to a frankly incredible 1440mm in 35mm terms. Considering that with an SLR camera, you would need at least 3-4 lenses to cover the same focal range, the single, fixed-mount lens of the Nikon P600 can be described as remarkably compact, even if it does extend quite a bit when zoomed to full telephoto. Super-zooms have always had a reputation for offering a high "fun factor", and the P600 is no different. The ability to quickly go from wide angle to ultra-telephoto is something that has to be experienced in order to be fully appreciated. For its size, the P600's lens is also respectably fast, with maximum apertures of f/3.3 at 24mm and f/6.5 at 1440mm. Note that the lens cap has to be removed before turning on the camera - failing to do so will result in an error message being displayed, and you'll have to turn off the camera before you can turn it on again, which is a bit annoying. Although if you only want to review what's already on the card, you can also power on the P600 by holding down the Playback button, in which case the lens won't extend. Nikon have included their VR (Vibration Reduction) image stabilisation system to help prevent camera-shake, allowing the use of shutter speeds up to four stops slower, while the Active mode ensures clear shots even from moving vehicles. Annoyingly there isn't a dedicated button to turn it on and off (it's somewhat buried in the Setup menu). In practice we found that the VR system makes a noticeable difference to the sharpness of the images, as shown in the examples on the Image Quality page. You don't notice that the P600 is actually doing anything different when anti-shake is turned on, just that you can use slower shutter speeds than normal and still take sharp photos. It didn't seem to adversely affect the battery life either, which is now a respectable 330 shots (a big improvement on the older P520's 220-shot life), so we'd advise you to turn it on and then forget about it. It's a good idea to turn VR off (via the menu) when the camera is mounted on a tripod, lest the system itself cause blurring by trying to counter camera shake that isn't there. Zooming is done by way of a conventional zoom lever that encircles the shutter release button sitting atop the right-hand grip. It is of the dual-speed variety: rotating it all the way in either direction will adjust the focal length quickly, while rotating it partially will cause the lens elements to move more slowly, enabling you to set the desired focal length more precisely. You can alternatively zoom using the innovative side zoom control on the lens barrel, which is a vertical rocker switch activated with your left hand. It has a slower action than the main zoom lever, and is therefore ideally suited to shooting video when you require a more sedate zoom with less mechanical noise. 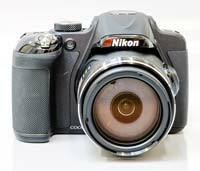 There are two different ways of composing images with the Nikon Coolpix P600: you can use either the eye-level electronic viewfinder (EVF) or the rear screen. Unfortunately, there are still no eye proximity sensors that would allow the camera to toggle between the two automatically, although at least there is now a button to toggle between the two. As the EVF is a bog standard affair with 201,000 dots and average magnification, nothing to write home about, especially in 2014, you probably won't use it very much anyway. The new 3-inch RGBW LCD screen is much nicer to look at, thanks to its high resolution of 921,000 dots, , an anti-reflective coating and adjustable brightness. Even more importantly, it's a vari-angle model that can be flipped-out to the side and tilted through 270 degrees, giving you a lot of flexibility in composing your shots. The layout and number of external controls haven't changed very much at all from the P520. You still get a traditional, top-mounted mode dial with P, A, S and M shooting modes - perfect for the photographer who wants to take full control - as well as full auto, Scene Auto Selector, Night Landscape, and Landscape modes. The Effects mode allows you to apply one of nine different special effects as you shoot with the Nikon Coolpix P600, with a live preview on the LCD screen showing exactly what the final image will look like. There is also a User (U) setting you can use to quickly retrieve a combination of your most frequently used settings. The shutter release, zoom lever and power button are in the same locations as on the P520, as is the same customisable Function button. In the Backlighting mode, the P600 captures three consecutive shots at varying exposures and combines them into a single photo with a broader range of tones. Three different levels are available for selection. When the Night Landscape scene mode is selected, the P600 takes several shots at a fast shutter speed and then combines them to create a single optimized photo, allowing you to shoot after dark without having to use a tripod. The Easy Panorama scene mode allows you to take vertical or horizontal panorama photos simply by moving the camera in the direction of the on-screen guides. Multiple shots are then combined into a single panorama photo. The angle of view can be selected from 180° (normal) and 360° (wide). The rear controls are also laid out very similarly to those of the preceding model. There is a well-positioned control wheel in the top-right corner (when viewed from the back), which makes it easy to change the aperture and shutter speed in A and S modes respectively, but there's still no second dial on the hand-grip which would have made operating Manual mode much easier. The familiar multi-selector with its centred OK button is similar to the P520, with the same individual functions that are mapped onto the Up, Down, Left and Right buttons. 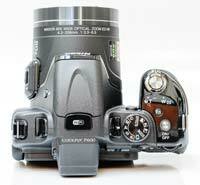 These include the flash and focus modes, the self-timer and exposure compensation, respectively. The multi-selector is a rotating wheel with an audible click and a textured surface to aid operation. There is still no obvious shortcut key to the ISO speed, which is only accessible from the menu (as is white balance) or by assigning it to the Function button. The P600's focus modes include AF, Macro, Infinity and Manual. AF can be centre-spot, user selectable from 99 focus points or camera selectable from 9 points. In Face Priority AF mode, the camera can detect up to 12 human faces and will focus on the one closest to the camera. We found that regardless of AF area mode, auto-focus speed was satisfactory for still subjects, but a little too slow for fast-moving ones. Manual focusing is also possible, though a bit awkward: you get a rudimentary distance scale on the right-hand side of the screen, and can adjust focus via the navigation wheel. The centre of the picture is enlarged to aid you with checking focus, but unfortunately this is achieved by way of interpolation rather than real magnification. Nikon have thankfully added focus peaking, which greatly improves the whole manual focus experience. 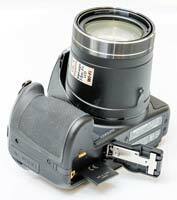 The flash of the Nikon P600 has to be popped up manually, using the button on the side of the mock pentaprism housing. You can set the flash mode to auto, auto with red-eye reduction, fill, slow sync and rear-curtain sync via the Up button on the multi-controller, but only when the flash is raised. As there is no hot-shoe or sync terminal on the Nikon Coolpix P600, and it does not offer wireless TTL flash control either, the only way to sync up an external flashgun with the camera is to optically slave it to the built-in unit. The new wi-fi feature allows you to wirelessly transfer photos to a compatible smartphone, tablet or Wi-Fi-enabled device and also remotely control the camera from another device using the Nikon app. This is a big improvement on the P520, which required the optional WU-1a Wireless Mobile Adapter to be fitted. It does, however, come at the cost of a built-in Global Positioning System (GPS), which the new P600 no longer supports. Instead the GPS data from your smart device can be embedded in the photos you transfer to it. The P600 has the ability to shoot full-resolution stills at up to 7 frames per second (fps), the same rate as its predecessor. There is also a slower burst mode, called Continuous L, in which the frame rate drops to 1fps, but you can capture up to 30 full-resolution photos at the Large quality setting. 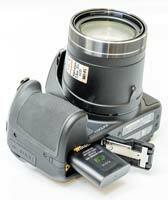 Note that you cannot use the flash in any of the continuous shooting modes. Disappointingly the P600 still doesn't support the RAW file format, something that all of its main competitors offer, and a prosumer feature that frankly we'd expect on this class of camera. The P600 can shoot Full HD (1920×1080 pixel) movies at 60i/50i/30p/25p frames per second, with stereo sound and full use of the optical zoom. It also offers a 720p/25p mode, an iFrame 960x540 pixel mode at 30/25p and VGA 640x480 pixel mode at 30/25p. Nikon's smart designers put the stereo microphone on the top of the camera right behind the flash. A Wind Noise Reduction function is available in the Movie menu. Serving to minimise the noise of wind blowing on the microphone, it is recommended to be turned on in strong wind only, as it may also make other sounds difficult to hear. Sensor-shift VR is not available during movie recording, but you may opt to turn on electronic image stabilisation. The P600 is also capable of high-speed (HS) movie recording. VGA videos can be recorded at 4x speed faster than normal speed and played back at 1/4-speed slow motion. 720p movies are recorded at 2x speed faster than normal speed and played back at 1/2-speed slow motion. 1080p movies are recorded at 0.5x speed of normal speed and played back at 2x speed fast motion. Sound is not recorded and no form of VR is available. Given the high frame rates, these videos require fast shutter speeds, which effectively means that you need very bright conditions. Recording movie clips is very easy on the Nikon P600 via the one-touch Movie Record button on the rear of the camera. By pressing this button, you can start recording a clip no matter what shooting mode you are in. You can use the optical zoom while filming, and full-time AF is also available. In use, we found that zooming in or out sometimes caused the image to go temporarily out of focus, but the AF system usually adjusted itself very quickly in these cases. The maximum clip length is limited to 29 minutes for both normal and high-speed movies. The Creative Slider and Special Effects can also be used when shooting movies, and they can be played back on a HDTV via the built-in HDMI connector, although as usual there's no suitable cable supplied in the box. The P600 supports the CEC feature for HDMI which enables playback control using your TV's remote control. The Nikon Coolpix P600's familiar Menu button accesses the usual Nikon menu system, which is clear and easy to navigate. Press this when in any of the shooting modes and there are three menus, Shooting, Movie, GPS and Setup, with two menus, Playback and Settings, available when you're reviewing an image. A big oversight is the almost constant need to use the menu system for setting the ISO speed, white balance, metering, and AF mode, with at least 4 button presses required to change these often-used features. The P600 is sorely missing some kind of quick menu system, accessible via an external control, to help speed up its general operation. In playback mode, pressing the same Menu button affords access to image editing, including Nikon's exposure adjusting D-Lighting function, Skin Softening and Filter Effects, image slide shows, and the automatic Quick Retouch. A button to the right features the familiar trashcan icon for deleting images on the fly and completes the rear of the P600. On the right flank of the camera - still viewing it from the rear - there's a metal eyelet for attaching the supplied shoulder strap and a plastic cover protecting the HDMI port and A/V out / USB port. On the left hand flank is another eyelet. There's a centrally positioned, metal tripod mount on the bottom of the camera. The P600 is powered by a 1850 mAh lithium ion battery, good for around 330 shots, that slots into the base alongside the SD / SDHC / SDXC card slot. There is a small internal memory too, but it will only hold a few photos at full resolution, so you'll definitely need a memory card. Note that recharging the P600 is a somewhat convoluted affair, with the battery remaining in camera and requiring the battery cover to be closed.